In FY2014, five experts on KOSEN were dispatched to IET, where they teach the students of the KOSEN model class. They cover areas such as machinery, civil engineering, electric engineering and welding, with a strong focus on experiments and practical exercises. 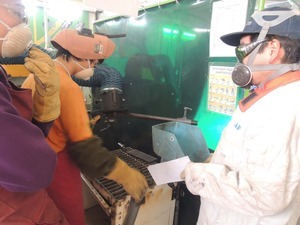 While the Japanese experts are in Mongolia, they also hold study sessions for teachers of IET, and guide them in terms of effective teaching methods and create a master plan for the KOSEN model class.